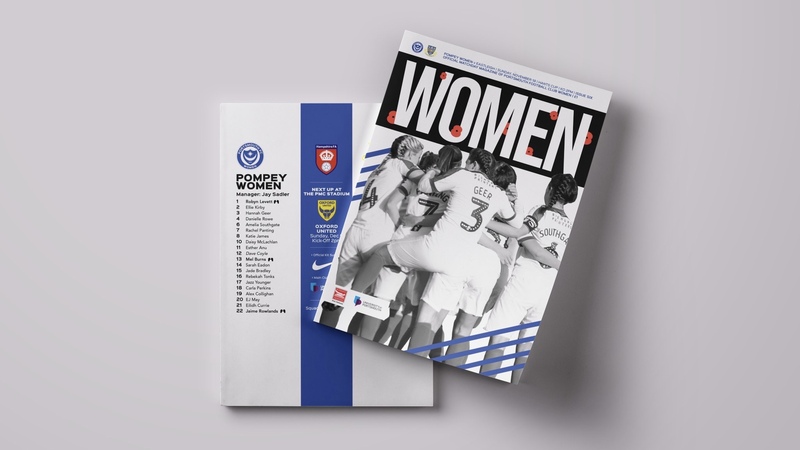 Today we catch up with the Ollie Cook, the young gun is working as Portsmouth FC Women‘s the matchday magazine editor and media manager. I was born in Portsmouth in 2001, but have lived in Gosport all of my 17 years. I left school in June last year (2017), and I joined Gosport Borough FC a matter of weeks later, at the age of 15. I’m a Pompey lad, so I support my local side. I’ve been a North Lower season ticket holder since the first season of the Paul Cook era, there’s nothing better to do on a Saturday afternoon. I’m currently studying at Fareham College, with the aim to progress onto the University of Portsmouth next September to study Graphic Design. You taught yourself how to use Photoshop and InDesign. Was this prompted purely by your role within Gosport Borough or had you always been creative? It was key for the role and my future to learn both softwares. I was already using Photoshop to do designing in my spare time. Through my education, in school and college, it’s very much been you need to learn the software yourself, so that’s what I did. My first step into design came during infant school when I was a part of a small team which came up with the ideas for the ’20 Is Plenty’ signage which can be seen around Gosport. It was a sign with the intention of letting drivers know that there’s no need to go over 20 miles per hour around the town, and the design featured an illustrated snail. My design progressed through to Lego, then I started watching Speedart on YouTube, which was mainly cartoon based. Since my designing has grown more sophisticated and more professional. Being a teenager did Gosport Borough Football Club give you much freedom with regards to design and content? Firstly, I owe my thanks to Jeremy Fox, who put faith in me and saw I had enough potential to flourish in the Gosport Borough media team. At the age of 15, I didn’t even have my GCSE results, so I was literally qualification-less. Every football game I go to, I pick up a matchday programme. I have always looked at the design of the magazines, even before joining Gosport, and it was great to create my own. Surprisingly, you could say, but Gosport gave me an immense amount of freedom to express my ideas whilst at the club. 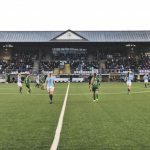 It was a turbulent time for the football club, after suffering relegation from the National League South the season before, and just about to set off on life in the Southern Premier, amongst all of the money problems. The role saw me work closely with former Portsmouth Football Club chairman Iain McInnes, by him contributing towards the matchday programme, and I also created an advert for his company which was displayed around the ground at the Hereford FC game last season. It was tough at times, for someone so inexperienced, on one occasion I had to produce three 40-page magazines in the space of just seven days. But, creating the programme wasn’t the only area I worked on for the club, whilst my role was voluntary, I was keen to increase my workload. 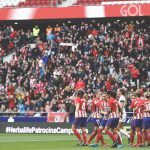 I created graphics for the club’s social media channels and ran the clubs twitter updates on occasion when I could get to games during the season. On the odd occasion I would join one of the club photographers on the touchline and do a bit of photography, it’s something I’m interested in too. My last game as a part of Gosport was against Portsmouth in a pre-season friendly this year and I owe Gosport Borough Football Club an immense deal of respect, and without the club, I wouldn’t be on the right track to a future in design. 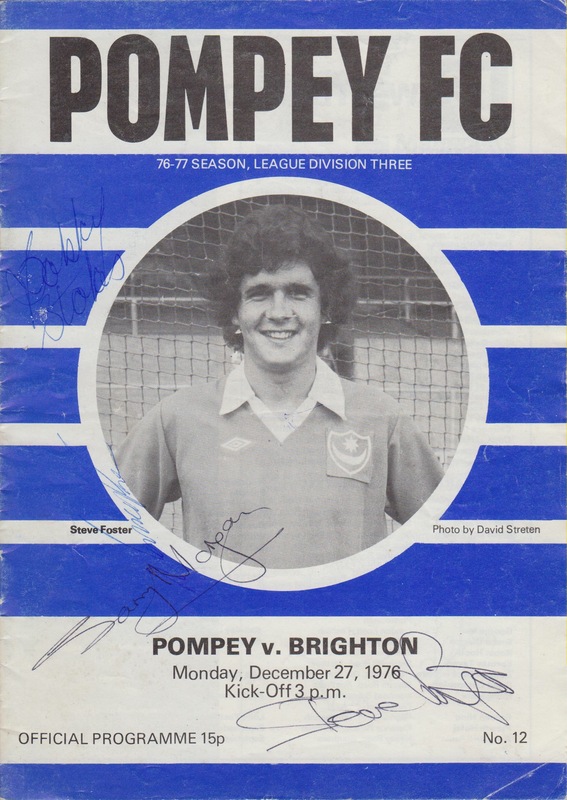 After working with Gosport Borough Football Club you quickly got snapped up by Pompey. Could you tell me about how that came about? It was actually during my time at Gosport that I joined Portsmouth FC Women. I joined the club in November of last year, so I had the responsibilities of both Gosport and Pompey from November 2017 till pre-season. Both roles, and following Portsmouth FC around the country, saw me attend 85 games last season, so I was constantly busy. I actually contacted Pompey in the first place to see if there were any roles in the media team up for grabs, not knowing I’d eventually take over the media entirely. The media manager was on their way out at the time, and I and Max Swatton, who works alongside me at the club, attended a couple of meetings at the ROKO Training Ground with Mick Williams (former Chairman of Portsmouth FC Women), manager Jay Sadler and secretary Bill Griffiths. It was a huge honour for myself to join the club that I support, and it certainly made it easier which what to produce on social media, because as well as being a worker at the club, I was a fan as well. My graphics and match reports have improved through my time at the club, and my matchday magazines too. I sometimes do cringe a bit looking back at some of my own from last season, especially with Pompey, but it’s good to look back, reflect and see where I can improve. Joining Portsmouth has given me a large platform to improve skills, with the outreach and presence the club has online. 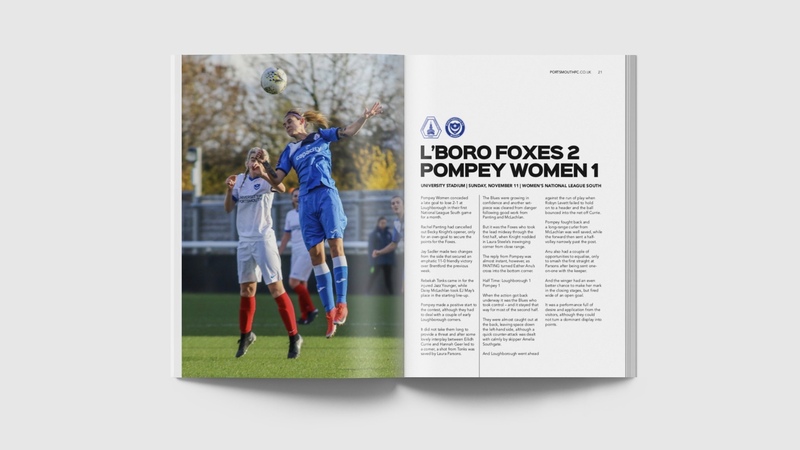 Originally our articles were published onto the old ladies website, but since the coming together of the men and the women’s clubs our articles are, like the men, published on the main Portsmouth Football Club website. 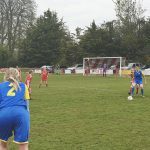 The summer just gone was huge for myself and Max to get right, with the change of name from Ladies to Women, the move to Baffins Milton Rovers‘ PMC Stadium, the departure of Mick and Ann Williams, and, of course, the coming together of the two clubs. 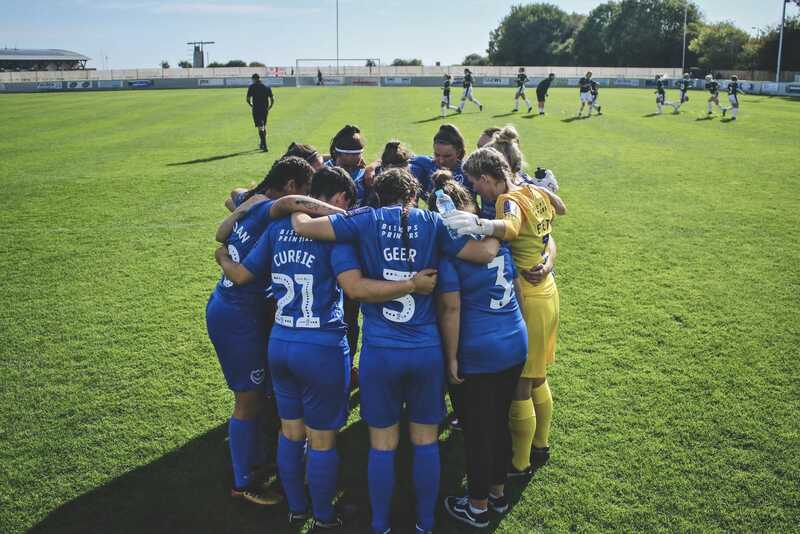 We played at Fratton Park against Queens Park Rangers Women on the last day of the 2017/18 season, and it was fantastic to experience a day as part of the media at a ground that I visit most Saturday’s as a fan. Both I and Max had an ‘access all areas’ pass, so we had free-roam of Fratton Park, which was class! Your 1976/77 Matchday Magazine Recreation looked beautiful. How did that come about? Cheers, I appreciate the comments. 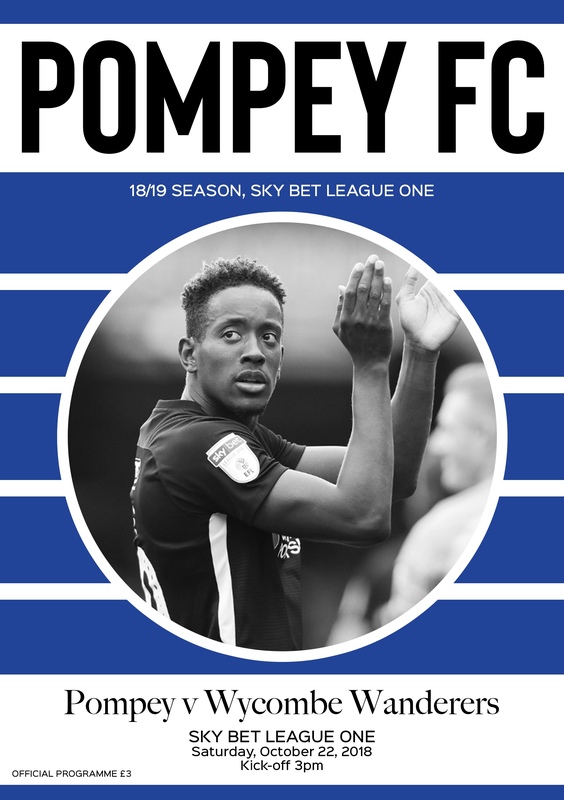 It was just a case of looking back at Pompey’s programmes over the years and I decided to re-create one. I have always liked retro artwork so I decided to give it a go myself. You’ve achieved so much in your short design career. What are your plans once you finish college? Are you aiming for a career in design? It may look like I’ve done a lot in a short space of time, but I won’t be happy till I’m at the top. I work tirelessly trying to improve my skills. At the end of my current, and final year, at college, I will be designing and editing the showcase catalogue which will cover my fellow peer’s work in the creative industries workspace. After I leave Fareham College, I plan to progress onto the University of Portsmouth to study Graphic Design. I’ve been passionate about design for a while now, and there’s nowhere else I’d rather study. And yes, a career in design is the aim, maybe a job at Sky Sports or BT Sport in the future, that would be nice. 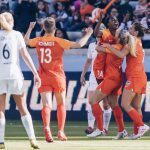 I love football, and I’d love to work in and around the sport. But, I feel, for myself, it’s crucial that I don’t stay one dimensional and have the ability to carry out whatever brief that I’m given. 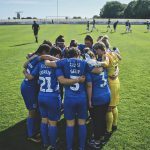 How would you assess the season so far for Portsmouth FC Women? 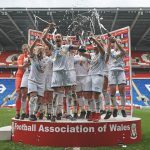 With regards to the women’s side this season always had the possibility to be a transition year for the team, and the football club as a whole after the takeover during the summer. The season started in a positive manner, with comprehensive victories over both C&K Basildon and Gillingham Ladies respectively. 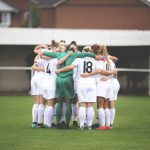 Key additions were made over the summer, which needed to be done after the departures, which Danielle Rowe, Jade Bradley, Sarah Eadon, Esther Anu, Bekah Tonks rejoining, and of course, Jaime Rowlands who’s currently on loan at Alton. All players have made a positive impact on the squad this season, and from what I can see, fitted in well with the group. 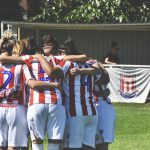 The girls who came in over the summer have added to what is a great group of people, both with the players and the staff, and they are all a pleasure to be around. I’m writing this on the way back after a cruel defeat to Cardiff in the league, and it’s there for all to see that we don’t always get the rub of the green from the officials in this league. 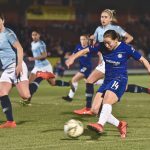 It has been well documented by many in and around women’s football as a whole that the standard of officiating isn’t up to the standards of the men’s game, and it’s something that seriously needs looking at by the FA. Away from the officials, we’ve had a steady start to the season as you could probably see. I believe we’ve got a squad there to compete with any in this division and I’m looking forward to seeing the current group grow together as a team. We’ve been knocked out of the league cup, and the plate, but we’ve started with a 14-0 win over Eastleigh in the Hampshire Cup, which we are looking to win for the fifteenth time. Plus we have a second round FA Cup tie at AFC Wimbledon next weekend. 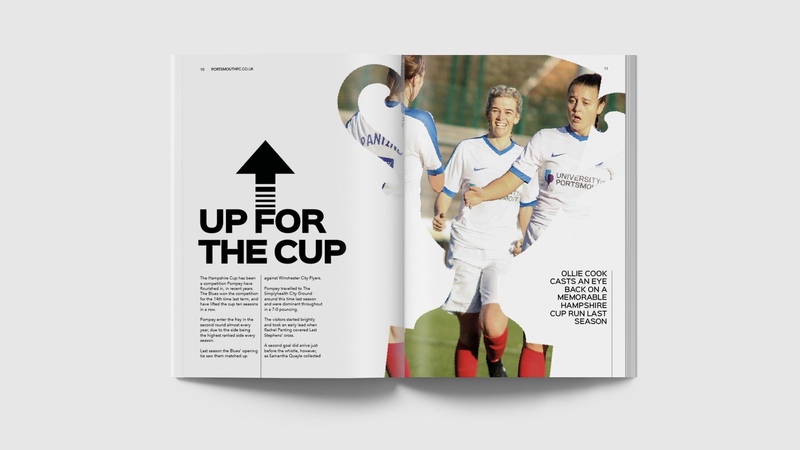 Everything is in place for this football club to reach the skies – so let’s make that happen.